Years ago, a friend took me to a pool to try out his scuba gear. While I did sort of get the hang of it, I distinctly remember how breathing underwater seemed unnatural. My intellect understood the concept of a tank of air, a regulator and a mouthpiece but there was part of my brain that was screaming the whole time, "Don't breathe!" If God had meant me to breathe underwater, He would have given me gills. You get harnessed up; you get instructions; you are hooked in tandem to a professional who has done this a thousand times but as you stand at the door realizing that you are about to jump out of an airplane, there is a voice in the back of your head screaming, "Ah! Noooo!" If God had meant me to jump out of an airplane, He would have given me a policy with a triple indemnity clause with a special payout so not only my wife but my children would be taken care of for the rest of their lives. In the 2007 movie The Bucket List, the two protagonists put together their list of things to do before they die and that included skydiving. In 2008, a member of my family celebrated her 28th birthday by doing a tandem jump. In 2009, George Bush Sr. celebrated his 85th birthday with a skydive. And I have never forgotten the 2 guys from high school who on a lark back in 1970 drove down to Rochester, New York and did a jump. For some unknown reason I wasn't available to join them and missed out at this chance at the age of 18. Rats. So, there you have it; just one of the items on "the list". Somewhere down in the States, a 25 year old man goes for a tandem jump with a 49 year old instructor who has over 8,000 dives to his credit. They freefall and instructor deploys the chute. At this point, it seems the instructor has a heart attack and dies. The 25 year old has the presence of mind to try and grab the toggles. He gets a hold of one of them and manages to steer them safely to the ground. Holy moly, does that inspire anybody to try this? Nevertheless, the idea keeps percolating away in the back of my head. So, for idle conversation, I mention my plan to try a jump. Well, much to surprise I have all sorts of people coming out of the woodwork with their personal skydiving stories. Heck, my wife's cousin did this about 25 times back in his twenties. Our new son-in-law has over 30 jumps under his belt. See? I knew I should have gone with my friends back in high school. I completely missed being ahead of the pack. All of a sudden, I say to myself, "Let's do it!" But where? I do a search and find the Parachute Club of Toronto located in Baldwin, Ontario, about an hour north of Toronto. A first time tandem jump costs $269. For $125, I can get air-to-air video and stills. With taxes, it all comes to $479.12. Maybe a little pricey but it will be an experience I'll remember for the rest of my life, right? Yeah, right. If I live that long. 3 days before, I mean to phone the service and make a reservation. I hesitate. Ah yeah, work to do, other things on my plate, blah, blah, blah. I realise I'm procrastinating because... well, I'm apprehensive. 2 days before, I manage to phone and make the reservation but after hanging up the phone, I can feel how tense I am. Why am I doing this? Nobody is forcing me; nobody has a gun to my head; I'm not going to get a medal or some sort of prize for doing this. I get in my Zipcar (see my blog Zipcars: I've seen the future, and it works) and head north up the 404. I arrive in Baldwin and park at the airfield. I go into the office and meet Adam, the head honcho. He explains the 3 pages of forms to fill out, double sided, all guaranteeing that I fully understand this is a dangerous thing I'm going to do with the risk of injury or even death and I will not sue the company or anybody if something happens. As he points to page 1 he says, "Fill in your address here" and I reply, "Ah, so you know where to send the body." I get back a nervous chuckle. Adam has me sit down to watch a little video with a strange looking man with a long - and I mean long - beard. He reminds me of the dude who does the Idomo commercials here in T.O. This gentleman hammers home the message that by signing the forms I am accepting injury or death and I will not under any circumstances try to sue the pants off the parachute school. I take the completed forms back to the office where somebody has to witness me sign and initial in many, many places. In case you haven't guessed, there is a small risk associated with this sport. Sign away your life or go home. But looking at the numbers, I just have to laugh. We truly don't understand what's going on around us and get scared for all the wrong reasons. In the United States, there are over 3 million jumps each year and about 30 people die as a result. This works out to approximately 1 death for every 100,000 jumps. So, your chances of dying by doing a skydive are 1 in 100,000. In comparison, 40,000 people die each year in car accidents. That works out to 1.7 deaths per 100 million vehicle miles. If we take the average person driving 10,000 miles a year, you have a 1 in 6,000 chance of dying in a car accident. That's hilarious! You are almost 17 times more likely to die getting in your car than by jumping out of an airplane; 1 in 100,000 versus 1 in 6,000. However, I like how the web site howstuffworks explains why we're afraid. 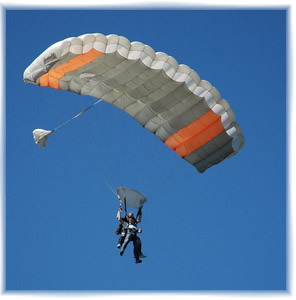 Skydiving accidents are so infrequent, they usually hit the headlines. In contrast, car accidents are so frequent, they are either not reported or we just tend to ignore them. Familiarity: we are familiar with cars; we drive them; nothing bad happens; we think it's safe. It's only when we check out the stats we may clue in to just how dangerous cars really are. Okay, I got the stats out of the way to prove this isn't such a crazy thing. But did that relieve the lump in my throat? Did that dry up the sweat on my palms? Good gawd, I can't believe I'm about to do this! Before arriving, I promised myself I was going to avoid the pitfall of all tense situations whereby the person in question attempts to alleviate their apprehension with levity. This usually entails us thinking up what we consider to be amusing talking points. If we think about it, we're probably not being very original. After all, we are not the first nervous person to do their first jump. Secondly, these guys have done this literally thousands of times. What are the chances we could say something they have not heard before? My donating blood story: Back in the 70's, I start to be civic minded by donating blood regularly. Shortly after starting, I go in one time and the nurse politely asks me which arm I would like to use. I reply, "It doesn't matter, I'm ambidextrous." Ha, ha, ha. Gawd, am I a card or what? She doesn't laugh. She doesn't even smile. She stands there politely waiting for me to tell her which arm I would like to use. Realizing I'm not going to get a rise out of her, I say, "Left." As I lay in my lounger bleeding into the bag, I cogitate - these were my post-university days when I didn't think or reflect, I cogitated - and it occurred to me that I might not be the first person to have ever thought of using the word ambidextrous in some feeble attempt to elicit a smile if not a laugh from this nurse or any nurse for that matter. Ha, ha, ha. Gawd, am I a card? No, I'm an idiot and an unoriginal one at that! Returning to my skydive; I think I managed a good job of not babbling away like a panicky first timer but remained calm, warm and friendly. Okay, the joke about writing down my address so they "would know where to send the body" was a major slip but I hope it was my only one. The leader of the club takes me out to introduce me to my tandem partner. "I'd like you to meet Chad, your new best friend." Ha, ha. Chad had jumped over two thousand times so I felt I was in good hands. He got me suited up and instructed me about the procedures. Since I paid for the video and pics, the school has to send up somebody who is assigned just to me for the purposes of taking pictures and video. I guess that explains why it costs $125. My man, Jeff, starts off with a quick video asking me why I doing this, how I feeling, etc. I note that he is armed with a special helmet which has both a still camera and a video camera. I walk out of the hanger area to the plane. As I walk out the door, I notice there is a big sign explaining that if you don't have insurance, back out now! Ha! Let's hammer that message home. We all climb aboard the jump plane, something called a Skyvan. This is more of a cargo plane where we all sit on the floor; there are no seats. We climb in the back which reminds me of those backdoor planes you see in war movies where guys parachute out of or cargo is skidded out the back. We take off. The noise level is quite high so it is pretty difficult to talk; you have to yell. The professionals are joking back and forth trying to keep the spirits up of us novices but I notice that the 3 of us doing this for our very first times have a quiet look to us like we are just waiting for the hammer to fall. Chad shows me his wrist altimeter and I see we're at 5,000 feet. I'm facing back and there is a Plexiglas part of the door where I can see out. We're up high - well, anything over a thousand feet seems high - but I know that we're going to jump at 13,500 feet (4,100 meters). We still have quite a ways to go. At one point, Jeff takes a couple of stills then decides to videotape me a bit asking me how I'm feeling. He records me commenting on all this by saying that we novices have the look of somebody who expecting, "To those who are about to die, we salute you." Just like in the movies, there are three lights over the back door: red, yellow and green. We have arrived at the drop height and the light changes from red to yellow. The staff opens the back door. We stand up and do a double check of our straps. We ain't turning back now! Chad and I shuffle forward. Remember that I am quite securely tethered to Chad, my back to his front, so we have to walk in unison to the door. The light turns green. I get to go first. Jeff is going to jump along side of us so he can grab some photos. I look out and we are up so high, I'm not sure I truly comprehend the height. I shuffle; I step; we're in the air. If you ask me what I was feeling or thinking at that moment, I think I would reply that I'm not sure. I was certainly on sensory overload doing something which up to that point in my life, I had never done. This seemed very, very, very unnatural. I have flown in planes, even small ones many a time but I had never stepped out of a plane in mid-air. This was very... ah, unusual. That first moment when I left the plane and I was in freefall was certainly an OMG moment. It certainly crossed my mind as to whether or not this was it; this was to be my demise. Terminal velocity is the term used to describe the fastest speed an object can attain given gravity, of course, but also including resistance from the air. For a skydiver in a belly to earth free-fall position, it is 195 km/h or 122 mph and he reaches this in about 15 seconds. Believe me, that is a face full of wind. Anybody needs to be wearing goggles for that but for me, since I wear glasses, those goggles were even more important. My glasses would have been ripped right off of my face! Our freefall lasted 60 seconds but the time, if you will excuse the pun, flew by. Jeff the camera guy moved around us both snapping pictures and taking video of us falling. He showed up in front of us several times giving us the thumbs up while filming. Finally Chad taps me on the shoulder to bring my hands in and pulls the rip cord. The chute unfurls then there is a tug as we start to float suspended in air. Jeff falls below us and captures this. Hanging in mid-air like that is somewhat surreal. I think about how the only thing between me and the ground is the harness I'm wearing. And of course, I'm so high up, I don't really appreciate that I'm high up. Ha! I think I'm more nervous looking over a ledge at 60 feet then I am being several thousand of feet in the air. While it takes a few minutes to come down, the time goes by quickly. Then again, I'm thinking I might be just so tense I'm not thinking about what's going on or even fully enjoying the view. It's grit my teeth time! Chad had wanted to do a sit down landing. Was he afraid I would mess something up? He had me put on a jump suit for the express purpose of protecting my clothes from grass stains however, when we land, at this very last second, we just end up standing up so we never sit down. A couple of staff members rush up to help with the chute and Jeff is there snapping away having gotten down before us. Ah yes, when we're several hundred feet over the airfield, I realize the plane is already back on the ground and taxiing to the hanger. Chad unhooks me and Jeff rushes up to ask what I think so he can capture this on video for posterity. In looking at the video, I think I come across a little overwhelmed. As I walk back to the office, I notice that I have an odd feeling which I recognise is a very mild urge to throw up. I don't; it is quite a mild feeling but it is the sort of thing one would experience if one does something very, very strenuous. The body is just on overload! I get out of the harness and my jump suit. Chad presents me with my official certificate testifying that yours truly has made a tandem jump. Apparently I have to wait 20 minutes while they burn a CD of my video and pictures so I sit with the 2 other first timers and we exchange a few pleasantries about why we decided to do this. It's over. I can relax. I now grasp just how tense I had been for the past couple of days. After signing up to do this, I had started to feel a certain apprehension and today, the day of the jump, I was definitely tense. [chuckles] Yes, I did this voluntarily. Nobody put a gun to my head. When I landed, Jeff asked me if I would do this again. I suppose so but now that I have the certificate, I do have bragging rights without actually having to do it again. Ha! Maybe I will just stick with that for the rest of my life. In total, I end up with 70 still photos and a 7 minute video. In reviewing all this later, I find they did do a pretty good job. I know $125 seems a little steep but having a pro right there taking your picture does seem to be the way to do it. The whole thing is done with a self-start program so I can just pop it in my computer. A menu comes up allowing me to see a slideshow or the video. With a little playing, I make a selection of pics and upload all of them with the video to Google Picasa so I can send around a URL to family and friends to brag about... ah, share my experience. Okay, am I going to advise you to try this? Is this the next best thing next to sliced bread? For me, it was a bit of a personal challenge: am I man enough to handle this? Ah, how macho of me, eh? Overall, anybody would probably say this is small potatoes on the danger scale; especially somebody like Chad who has jumped over two thousand times! Oh, by the way, when I jumped, I looked! Of course, I was grittin' my teeth! By the way and if you will excuse my French, do you know the saying "to be scared s**tless"? Well, I discovered it's not true. I think it took a full 24 hours after my jump before my sphincter unclenched. That was a very eloquent description of the whole first jump experience. Thanks for sharing it!